Sushi and full bar in a modern, 2-level, sleek, club-like atmosphere. Many vegan rolls available (most of the Veggie Maki Sushi menu is vegan. Including a roll with seitan!) Our fave is the TLT with smoked tomato paper and Vegan mayo. 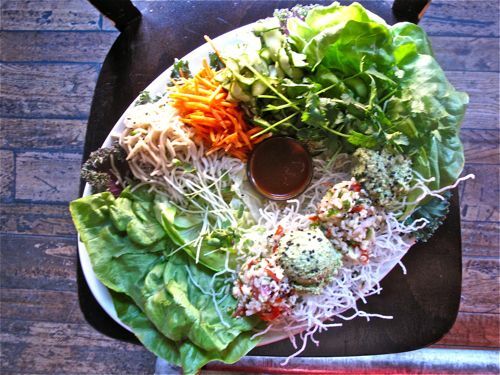 A huge plate of lettuce wraps with edamame hummus, soba noodles and a million other things makes for a fun share. Happy hour deals upstairs are not to be missed. Note: the tempura is now vegan! Went here for dinner last night. We love the atmosphere, but without having to ask for substitutions or eliminations of certain things like mayo or cheese or whatever, the vegan options are somewhat limited. There’s a couple salads, probly 3 or 4 sushi rolls, and maybe 2 appetizers. But I will say that all of the food we did eat there, was very good.